She has been made for Lobez, Poret ve Cie., Boulogne by A.NOrmand, Le Havre in 1913. 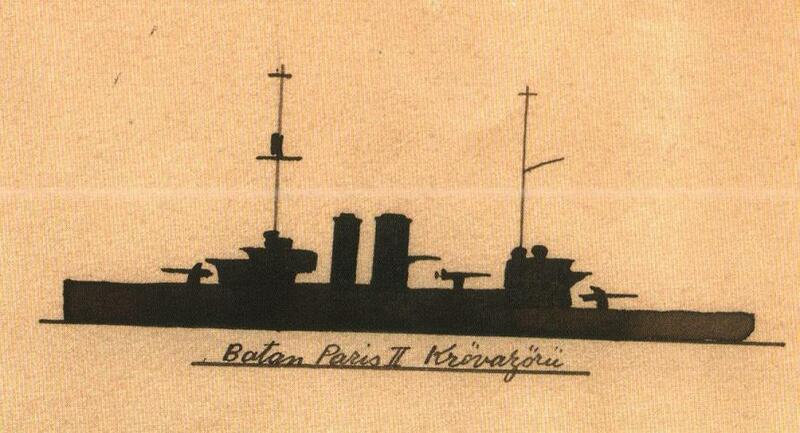 She had sunk by the Turkish shore batteries commanded by Lt Gunman Mustafa Ertugrul in 13th of December 1917. The World War I shipwreck found near the Kemer harbour at 30 meters depth amazed everyone. The wreck found in 1995 was a steam war ship. But noone found which ship she was. After the new had been heard, researchers from all over the world came and dived to the wreck. But everyone was confused. English, Americans, French... Noone could solve the ship's mystery. 7 years later at 1st of January 2002, fate smiled to the face of Mustafa Aydemir, who was studying on the Lykian cities in the Suna Kirac Museum. He had faced with Gunman captain Mustafa Ertugrul and a ship he sunked called Paris in a book called "Bir zamanlar Antalya (Once Upon A Time Antalya)" written by doctor Burhanettin Onat. Onat was saying " It was the war times. In this time a man camed and with his four artillery and his heart he defeated the enemy. He sunked Paris and Alexander war ships. Researcher Mustafa Aydemir followed the traces. First he found the daughter of Burhan Onat and learned the the actual name of the ship was Paris II. After that he found Mustafa Ertugrul's family and got his diaries which was like a treasure for a researcher. He achieved information about the sea wars in mediterrenan even not existing in the goverment. Captain had taken notes day by day, and written the information of the war on the maps. Mustafa Ertugrul was a legendary Ottoman soldier. Just like "Hell Gunman Captain Cemil" ,the hero of the Kemal Tahir's "Tired Soldier". His fame was not only known from Ottoman soldiers but also known from the enemy soldiers. After the pact, the English commander who came to Aydýn front to collect the weapons also knew Mustafa Ertuðrul and he sayed to him that "It is not honourable to take the guns of such a hero like yourself" and leave his four guns to him. With the fate, these four guns were one of the most important guns in the hands of the national forces when the Salvation War beginned. Mustafa Ertugrul would make the hell for the invaders with them. He had sunked a plane ship for the first time in the history with artillery shots. He sunked the 110 meters long England's legendary plane ship "Ben My Chree" near Meis island, later he sunked the French ships Paris and Alexander near Kemer. Mustafa Ertugrul is a real hero. After sinking their ships, he rescued enemy soldiers from the beaches, first aided them and in his memories he had written: " We couldn't show our joy by victory because of the wounded enemy soldiers". Researcher Mustafa Aydemir stated that I was first start to write an article but a book came out about his book "Ben bir Turk Zabitiyim" published by Denizler bookshop. Aydemir states that the captain didn't like to tell people what he did. He dropped an aeroplane in Canakkale, he managed to add mountain men to national forces. There was a story about Mustafa Ertugrul writing his memories. Mustafa Aydemir tells this history: "One day the great commander Mustafa Kemal visited him in Antalya and he said him to write these memories or they will be forgotten. He accepted this sentence as an order and wrote his memories but said that these memories won't leave his room." She is a French cargo ship, lying in a sandy bottom at 25-33 meters depth, 1.5 kilometers east of the Kemer harbour. Hammerhead type ship has 3 decks and 2 warehouses. Because of the hatches of the warehouses had been made from wood, they got heavy damage from the passing time. This wreck has a lot of visitors especially at the last few years. In the ship main structure there are holes maden by shells. In the port side of the ship on the sandy bottom there are cables. It is possible to see ammunitions, warehouses, propeller and Paris wiritng in the front but because of the sandy surrounding the life around isn't too exciting. But it is a great wreck for the wreck divers. A swimming Monument is being planned to be made above the Paris 2 wreck. A platform for 150 persons and 5 ships that will be 15 meters diameter is being planned. The monument will aslo have historical information in a lot of languages. It will also include a museum with photographs and documents. You can find detailed information about the ship, and her sinking in the book "Ben bir Turk Zabitiyim" written by Mustafa Aydemir.